Everyone loves chocolate and there is nothing quite like the taste and feel of smooth, creamy chocolate melting in the mouth. Thus, it was a pleasant surprise when two experts in the culinary arts – Chef Chris Koetke and Chef Eliezer Campuzano – decided to celebrate International Chocolate Day (September 13) with members of the media in a cooking demonstration using chocolate at INTI’s School of Hospitality in Subang Jaya. Campuzano (left) prepares a savoury mole while Koetke is ready to serve a smoked chicken dish. “Chocolate has been called ‘food of the gods’ and for good reason,” said Chris Koetke, Vice President of Culinary Arts, Laureate International Universities and Vice President of Kendall College School of Culinary Arts. “In ancient times chocolate was used in royal and religious ceremonies as well as for medicinal purposes. Since then, men have discovered a sumptuous variety of uses for chocolate in food preparation,” added Koetke, who also hosts the Emmy nominated cooking show ‘Let’s Dish’ in the United States. “In Mexico, where I come from, chocolate is prepared with an assortment of spices for a very distinctive and rich flavour. In addition to being used to make hot chocolate, Mexican chocolate is used in traditional Mexican dishes like mole and in baking,” said Eliezer Campuzano, INTI’s executive chef and owner of a pastry and chocolate workshop in Mexico called “Idea Chocolate”. Koetke preparing Smoked Chicken Sauce with Black Pepper Chocolate. Campuzano and Koetke prepared a mouth-watering selection of delicious and healthy main course and desserts that included Smoked chicken sauce with black pepper chocolate, mole and luxor tarts as they articulated on the history of chocolate, varieties of chocolate foods and drinks and chocolate’s health benefits. Koetke, who was visiting INTI to deliver an international education experience to students via a series of culinary workshops, also elaborated on the highly-acclaimed Kendall College School of Culinary Arts. INTI’s Diploma in Culinary Arts programme is affiliated with Kendall College, Chicago’s No.1 school for preparing students for a career in hospitality management and culinary arts*. The 2-year programme offers a focus on practical and entrepreneurship skills in the area of culinary and food service operations, with specialisation in Kitchen & Larder and Patisserie. 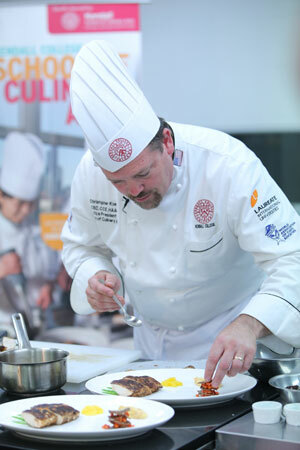 “By bringing international chefs like Chef Koetke and Chef Campuzano into our training restaurant and classroom, we enhance students’ knowledge and abilities through a blend of international exposure, innovative learning and individual development,” said Andrew Pennington, Dean of INTI’s School of Hospitality, who is himself a highly accomplished professional with over 20 years of experience in the hospitality industry across Asia, the Middle East and Europe.